A major update of the commonly used life cycle impact model ReCiPe is available. The updated ReCiPe2016 provides a state-of-the-art impact assessment method to convert life cycle inventories to a number of harmonised impact scores on midpoint and endpoint level. In collaboration with professor Mark Huijbregts, with whom we collaborated on the update, we provide an overview of the key elements of the update as well as some experiences from the method developers. A cause-effect pathway shows the causal relationship between the environmental intervention (for instance, the emission of a certain chemical) and its potential impacts. An example of a cause-effect pathway could be the emission of a chemical into air, leading to increased chemical concentrations in freshwater, and subsequent disappearance of species. LCA professionals can choose impact indicators at different stages in the cause-effect pathway, for example the midpoint or endpoint. 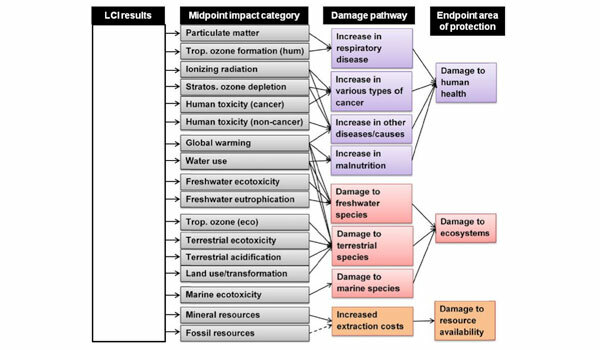 The relation between midpoint impact categories and their area of protection is shown in Figure 1. – Water consumption can lead to human health problems when water shortage causes malnutrition. Furthermore, the consumption of water can lead to a loss of terrestrial species. The latter was modelled with use of damage to vascular plants, using net primary productivity as a proxy. In freshwater ecosystems, water consumption can lead to a loss of fish species due to decreased river discharge. This is highly relevant for water footprinting. – Like water consumption, global temperature rise can also lead to decreased water discharge and accompanying changes in fish species occurrences. This newly included pathway can provide increased accuracy in accounting natural capital, or studies focussing on biodiversity. – An increase in tropospheric ozone damages the natural vegetation worldwide, via reduction of seed production and growth, acceleration of leaf senescence and a reduced ability to withstand stressors. Figure 1. Overview of the impact categories that are covered in the ReCiPe2016 method and their relation to the areas of protection. The dotted line means there is no constant mid-to-endpoint factor for fossil resources. In contrast with the previous version, ReCiPe2016 also provides global characterization factors instead of only European. Additionally, characterization factors are available at a country- or region scale for fine particulate matter formation, photochemical ozone formation, acidification, freshwater eutrophication and water use. The new version of ReCiPe contributes to a better understanding of the environmental impact of goods, services and processes – up to date with the current scientific knowledge. As some wishful thinking is healthy, there are obviously more improvement opportunities on the method developers’ wish lists. Future improvements relate to a regionalization of more impact categories, moving from local to global species extinction and adding more impact pathways. Yet, using this updated method has important benefits for sustainability practitioners, not just those specialized in LCA. The insights obtained can be used to reduce the environmental impact and to assess the extent in which a circular economy is beneficial for the environment. For people that are particularly interested in water footprinting, the newly included impacts of water consumption on human health, terrestrial ecosystems and freshwater ecosystems, plus the option to see these impacts alongside other environmental impacts, may be interesting. Furthermore, the new ReCiPe can be used as the basis for tools addressing biodiversity impacts of supply chains, like BioScope. ReCiPe2016 was developed in collaboration between the Dutch National Institute for Public Health and the Environment (RIVM), Radboud University Nijmegen, Norwegian University of Science and Technology, and PRé. In this updated version, PRé and The Radboud University of Nijmegen continued the fruitful collaboration of the past years, in the development of the mineral and fossil resource scarcity improvements. This work is part of the soon-to-be-finished PhD thesis of our colleague Marisa Vieira. Additionally, PRé worked also in the application and implementation of ReCiPe2016 into SimaPro, the leading Life Cycle Assessment software. Thanks to extensive and conscious testing by both the method developers as well as PRé’s consultants, ReCiPe2016 was smoothly implemented. Updating a well-known life cycle impact assessment method like ReCiPe is a responsible task. The method developers are excited about this operational successor and hope it will be as successful as its predecessor ReCiPe2008. ReCiPe 2016 will automatically be available for LCA practitioners in the next SimaPro update scheduled for April this year, but can already be applied with use of a csv-file. Please contact us for more information.